A great way to introduce your brilliant babies to the ABCs while teaching them about everyday life in the rip-roarin' and rambunctious Wild West. This unique era of America's nineteenth-century history featured buckskin-clad buckaroos, dastardly desperados, smarmy snake-oil peddlers, and the inevitable arrival of the cavalry--always just in the nick of time. All of these things and more are brought to life through artist Greg Paprocki's vintage-inspired illustrations. 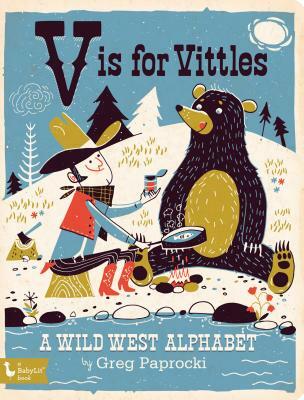 From the creators of BabyLit(R) V Is for Vittles: A Wild West Primer is part of a unique new series that opens a window on history while teaching toddlers the ABCs. Different eras of history--including the nineteenth-century American West, medieval Europe, and Victorian England--are brought to life by Greg Paprocki's fun and enticing illustrations in this new series of board books for brilliant babies. Greg Paprocki works full-time as an illustrator and book designer. He's illustrated several Curious George books, as well as The Big Book of Superheroes for Gibbs Smith. He began his career as an advertising art director after studying fine art and graphic design at the University of Nebraska. He lives in Lincoln, Nebraska.